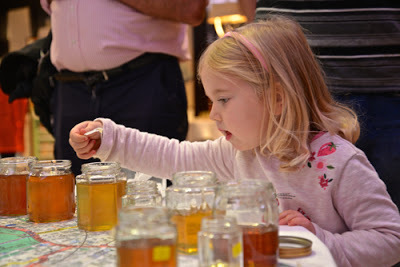 > The Hive Honey Shop- Honey Winner at yesterdays London Honey Show! 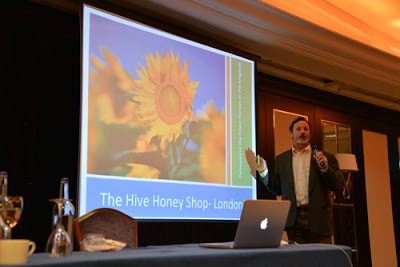 It was a great turn out at the London Honey Show despite the London Half Marathon taking place at the same time. I got detoured away for a fun three hour nightmare journey, which normally only takes 40 minutes from Battersea. My son Max, forth generation beekeeper, was with me for support and to help set up our display of rare beehives collected during my beekeeping journeys around the world. Being so late to arrive meant that my guest talk, “Tales of beekeeping from around the world” was rescheduled for 1:30pm and Hanna Reeves jumped in and did her talk on, ”Experiences of an apprentice bee farmer”. It gave me a chance to catch my breath, grab a cup of coffee and get my honey entries in before the deadline, just in time. I wandered around the hall and took in all the trade stands, food stands and DIY bee crafts. It was a great atmosphere, giving many beekeepers a chance to meet up again, exchange beekeeping tales both good and bad. Ms Jo Hemesley, Assistant Director of Sales for the Lancaster London and her team made this event happen. It has a lighthearted family feel to this show. 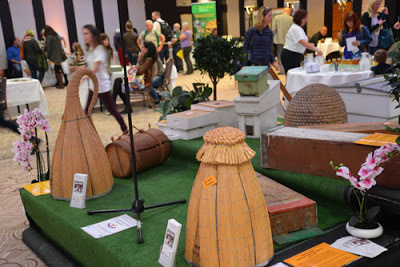 A gentle build up to the very competitive National Honey Show taking place on October 29th-31st. My talk was well attended and my power point slide show did not fail me (as in the past). Lots of questions at the end of the talk, which I love, as it gives me a chance to bounce off the audience. 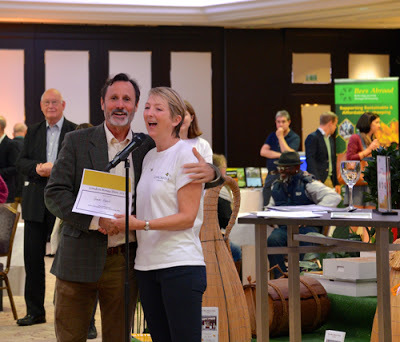 And the icing on the cake is that we won first prize for the “Best Rooftop Honey” and second place for “Best Home Honey”. So special was my winning rooftop honey that someone”lifted” it from the show. So I will be keeping an eye out that it does not show up entered in The National Honey Show! Great show at a lovely venue! Here are some photos from the day.